It turned out pet sitting iguanas wasn’t for her, and this particular iguana didn’t make it any easier. His name was Michael, and he perched atop the curtain rod above the slider door she had to enter, making every entrance a spit showered death wish. Coaxing him into his cage by prodding him with a mossy stick proved difficult. Dispiriting. Apples didn’t help like his owners assured her they would. Even red delicious. Even honeycrisp. Michael kept spitting, hissing and scurrying away on his scaly vernal like legs. The two weeks trickled by. She persevered. So did Michael—with his spitting. She began disliking the name Michael. She began to resent reptiles. She wore a raincoat when she went to feed him. 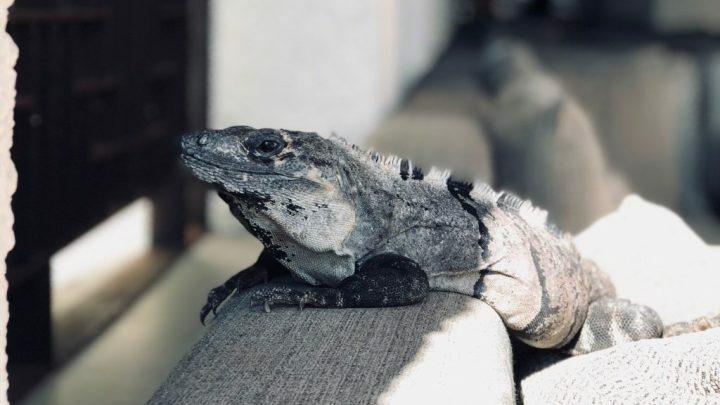 Monica Flegg lives on Nantucket Island where she dog sits and house sits, but after hearing about her sister’s experiences reptile sitting, she refuses any part in that. Her writing has been published in numerous journals including; Snapdragon, Dying Dahlia Review and Milkweed.